Does the trike have a hand throttle? Yes, for the 1000w and 3000w versions, there is a hand throttle integrated as part of the left handle bar. The hand throttle is must be deactivated when driving on public roads by using the the “low” or “high” modes. When driving on private roads with the “off road” mode enabled, the throttle is active, and you can drive the trike at up to 60 km/h using only the throttle (you don’t have to pedal). What brakes are on the trike? The Trike has three brakes. Two coupled front wheel 160 mm hydraulic disc brakes, and one rear wheel electrical brake (e-Brake). The two front wheel brakes are operated by using the right brake lever. The rear wheel brake is operated by using the left brake lever. For normal braking and when riding downhill, the rear wheel e-Brake is preferred, as this brake will convert the moving energy of the trike into energy in the battery (energy regeneration). The rear wheel e-Brake will regenerate between 0 and 1500 watt of energy, depending upon the position of the left lever. The amount of regeneration is shown on the display, as a negative watt amount. When using either the left or the right brake lever, the electrical assist is turned off immediately. When braking hard, please use both front and rear brakes simultaneously. to stop the trike from rolling and for parking the trike, you can use the parking brake, which is integrated into the right brake lever. Serial numbers are located on the front crank housing. Where can I testride a Trike? The recommended load limit for the rear suspended rack is 25 kg. The rack is designed to carry two bags of up to 35 L each (e.g Ortlieb back-roller pro plus). Overweight is not a problem within limits. The total load limit is 200 Kg, this includes the weight of the rider plus the weight of luggage. 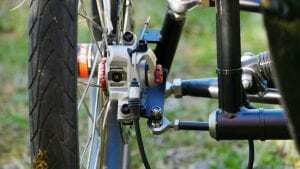 This means that rider weight of up to 180 Kg is ok. We will ensure of cause that the springs have the correct strength and adjustment to fit your weight. Why buy a VELOKS trike and not a normal e-bike? You can concentrate on pedaling and not have to worry about keeping the balance. When stopping at a red light, you can keep your feet in the pedals. It is much more stable, and it is more fun to drive. Your bum will not hurt, even after many hours of driving. Better stopping power with two front brakes and one rear brake. Will drive faster on a flat road or downhill due to less wind resistance. Prepared for more power and higher speed. Will take higher load (200kg). More difficult to transport, as it is wider and heavier. Difficult to get through narrow doors openings. Take up more space when storing. If you have back pains or problems, and cannot ride an ordinary bike, you will most likely be able to ride a VELOKS trike. This is because you lean back and the seat supports your back, and because the suspension will avoid bumps in the road from hurting you back or spine. Recumbent refers to the seated position; many also call recumbents for ‘bents.’ Recumbents have two, three or four wheel. Why is it called a Tadpole Trike? Any vehicle that consists of two wheels in the front and one wheel in the back is a tadpole trike. A tadpole trike is also called a “reverse trike” or a “recumbent tadpole trikes”. The battery is designed and produced by VELOKS in Denmark. Only new quality cells from Panasonic, LG or Samsung are used. For 1.5 kWh and 2.3 kWh 18650 lithium cells are used, and for 3.3 kWh , 4.1 kWh & 5.0 kWh 21700 lithium cells are used. The batteries consist of 16 “cells blocks” in series, i.e. 60 V nominal. Each “cell block” consist of either 6, 12, 18 or 21 matched cells in parallel. The cells are connected via 100% pure nickel strips that are spot welded to the cells. To ensure equal current load to each individual cells, the main power wires are connected to the cells blocks by means of a solid cobber bus, and “cells blocks” are interconnected in series between each individual cells by nickel strips. The battery box is a sandwich construction that is made of carbon fiber as the outside layers, Kevlar as the middle layers, and fiber glass as inside layers. This ensures a very strong and stiff, yet crack resistant box, which is electrical isolated. The battery is protected by means of a battery management system (BMS). The BMS will limit the charge current to 15A and limit the discharge current to 70A to protect the battery. Also when charging the battery, the “cells blocks” are automatically balanced when the battery is charged to 100%. Why is the battery mounted under the seat? The VELOKS MK3 trike support battery capacities from 1 kWh to 4 kWh, and such batteries have a relatively high weight from 6 kg to 17 kg. By placing this weight at the center under the seat, it will improve the stability of the trike (lower center of gravity). It also “hides” the large battery from sight and makes the trikes look better. Thirdly, the battery has 4 mounting points, and can be easily removed by opening the two snap clips and sliding out the battery. This is handy if you need to charge the battery inside due to lack of external power, or to ensure that the battery starts with maximum capacity when it is very cold outside. Why is the motor chain attached to the left side of the rear wheel? •	Much higher torque transfer to wheel. •	A much stronger motor chain. •	Regeneration of energy and electronic braking. •	The use of all types of internal hub gears and all type of external gear systems. •	Two independent drive systems, motor of the left and human on the right. Yes, the VELOKS MK3 trike is defined as a Pedelec (Pedal Assist). The VELOKS MK3 come with a “EC Declaration of Conformity”, and is EC marked. This means that the VELOKS MK3 trike, is a regular e-bike with a maximum continuous rated power of 250 watt, power by a battery which cuts out at 25 km/h, and which only active when the rider pedals. Depends on two things, the charger maximum current, and the installed battery capacity. 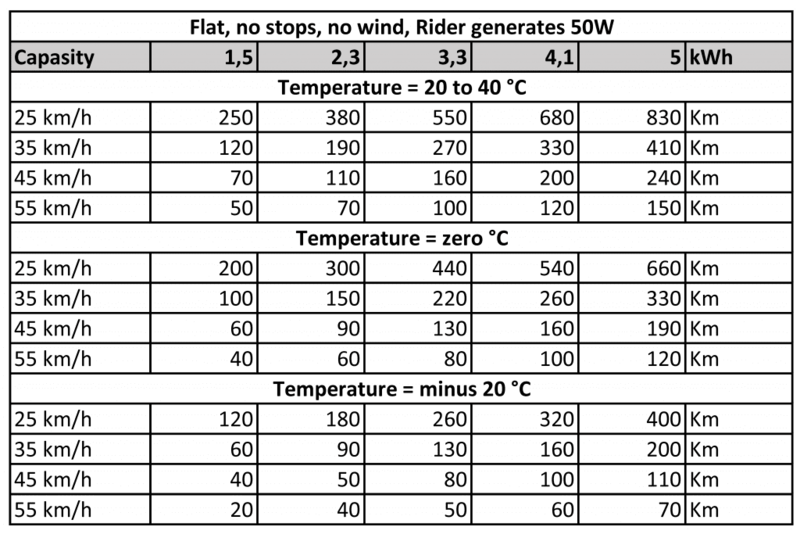 Using the standard charger (8A) that comes with the trike, for the 1.5 kWh battery, charging an empty battery to 100% will take approx 4 hours, for the 2.3 kWh approx 6 hours, for the 3.3 kWh approx 8 hours, and for the 4.1 kWh approx 10 hours, and for the 5.0 kWh approx 12 hours. There is an option for a 15A charger for 3.3 kWh and above, that will approximately half the above times.